It's a spoon... it's a straw... it's pure genius! 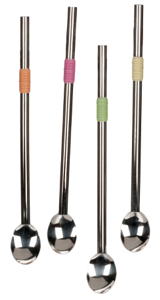 Perfect for ice cream floats and other frozen delights, our 8 1/2" long spoon-straws are ready to help you scoop and sip your treats with just one clever utensil. Colorful silicone bands help identify drinks and provide a nice grip for sipping and twirling. Unlike plastic throwaway versions, our spoon-straws are made of durable, reusable 18/8 stainless steel that are dishwasher safe. 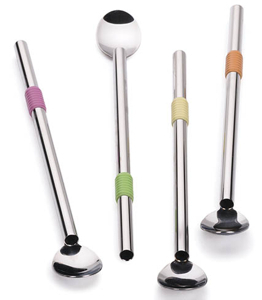 More thorough cleaning can be accomplished by using our Cleaning Brush for Spoon Straws. Perfect for ice cream floats. My husband has been very sick and has just connected with this childhood treat. 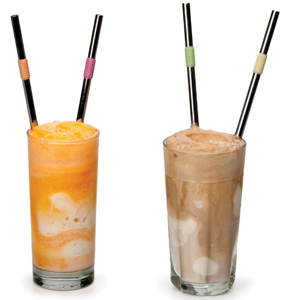 The spoons straws are fabulous for slushy's, root beer floats and the likes. They are sturdy and colorful. They bring back memories of the ones my mom had in the 60s.